Ethel W. Pearsall Phillips was born in Beaufort, North Carolina on May 17, 1943 to the late David and Ethel Maria Williams-Pearsall. She found eternal rest on October 25, 2018. The youngest of nine children, Ethel grew up in a close knit southern family surrounded and protected by her parents and older siblings. 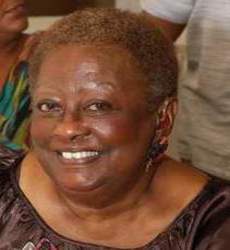 She attended public schools in Beaufort, NC and graduated in 1961 from Queen Street High School in Beaufort. Shortly thereafter she re-located first to Newark, New Jersey and then Red Bank where a host of relatives had settled before her. One of her fondest memories as a young girl was caring for her many nieces and nephews while her older siblings prepared a place for the family up North. In 1971, Ethel was joined in holy matrimony with Randolph "Randy" Phillips of Long Branch, NJ. They settled in Long Branch and raised two sons, Eugene Darryl Brown and Randolph Phillips, Jr. Her career choice was helping others as a nursing assistant for 25 years at Marlboro Psychiatric Hospital in Marlboro, NJ. Following her retirement from Marlboro in 1986, she worked for several years in private duty care throughout Monmouth County. Upon the loss of her hearing in the mid 1980's, Ethel attended a school for the deaf where she received a certification in sign language, and volunteered her time to organizations devoted to the deaf. Ethel also sang with the choir for the deaf at Second Baptist Church in Asbury Park, NJ. Ethel was raised in the Episcopalian Church and continued her walk with Christ by joining Pilgrim Baptist Church in 1986 under the pastorate of Rev. Millard Harris and later Rev. Terrance Porter. She was an active member at Pilgrim as an usher, chairman of the outdoor floral ministry, and for 24 years she was the director of arts and crafts for Vacation Bible School. When ill health forced her to retire from her duties at church, she continued to study the word in her home, and in her last year of life at Manor by the Sea Nursing Home. Ethel had a keen eye for fashion, accessories and interior decorating. She was an excellent cook, a gifted seamstress, a frequent shopper, a bargain hunter and above all, she possessed a great love for her family and friends. Nothing pleased Ethel more than preparing a feast for and getting together with her family and friends, advising them on how to pull together a great outfit with just the right accessories, and buying girfts to beautify their homes. One memory that will be cherished by family and friends are the beautiful gifts - perfectly wrapped - she provided at Christmas time and other occasions. Ethel was predeceased by her parents David and Ethel Maria Williams-Pearsall; granddaughter Jelani Phillips; brother Fred Pearsall; sisters Gladys Hill, Josephine Webster, Bessie Lindsey, Shirley Pearsall Gaines and nephews David Pearsall, David Paul Webster and Rev. T. King Webster. Cherished memories will forever remain in the hearts of her devoted and beloved husband Randolph "Randy" Phillips Sr.; two sons Eugene Darryl Brown (Cheryl) and Randolph Phillips Jr. both of Virginia; a stepdaughter Kerri Dickerson of Neptune; one sister Julia Arriola (Richard) of California; one brother David Pearsall of Asbury Park; two precious grandchildren Jamel Brown (Amber) of Maryland and Katrina Stotts (Ontario) of Virginia; two great-grandchildren Riley Yates-Brown and McKinley Yates-Brown; nieces Wanda Webster Stansbury (Charles), India Earlene Webster, Shirley Ricki Webster, Audrey Vosburg (Michael), Sheila Gaines, Monica Gaines, Clotilda Johnson and Leslie Christine Morris; nephews Dr. Franklin Gaines Jr., Gregory, Bernard and Andrew Lindsey Jr.; goddaughter Fanya Gallo (Michael); in-laws Leslie Morris, Carolyn Morris, Rodney and Susie Morris and a host of other relatives and friends.